Today, Richmond is playing up it’s role in the new Spielberg movie Lincoln and using it to promote tourism to the river city, but fifty years ago Richmond was a different city. In the early 1960’s, Richmond celebrated being the capitol of the Confederacy during the Civil War Centennial, while African-Americans picketed outside Thalhimers Department Store urging blacks not to buy at a store that denied them the right to eat at its restaurants. 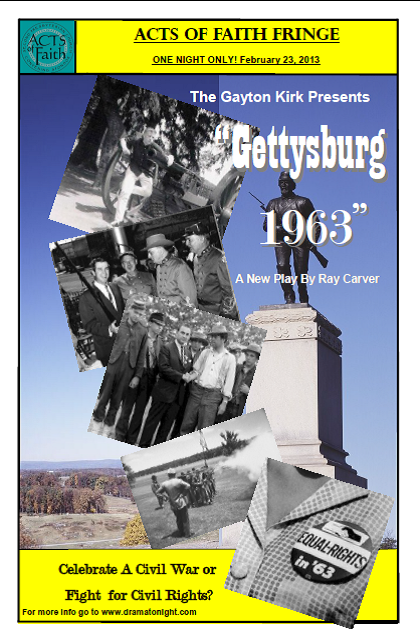 The new Acts of Faith play, Gettysburg 1963, looks back at that time. Gettysburg 1963 is the story of Frank Lacona and the choice he felt he had to make during the summer of ’63. In 2013, a seventy year old Frank looks back at his twenty year old self and the family vacation to Gettysburg during the centennial celebration of the battle that leads him to join the March on Washington and hear Martin Luther King shout out “I have a dream”. As Frank says about his youngerself, “Me? I wasn’t the kind of person to go to any sort of Civil Rights anything — I don’t think I’d ever even met a black person or even seen one up close.” This is the story of what changed Frank’s life. Gettysburg 1963 was performed on February 23, 2013 as part of the Acts of Faith Festival. It featured a panel discussion after the performance featuring local historians, clergy, and academics talking about the play, the Civil War Centennial, the Civil Rights Movement, and faith.